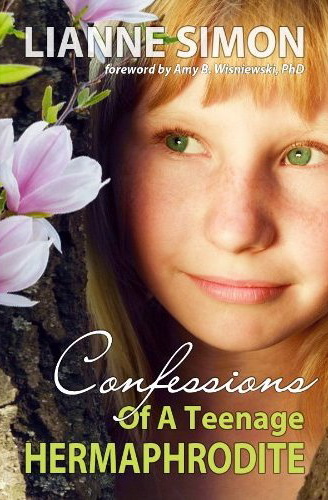 Confessions chronicles two years in the life of Jamie, a teen born with Mixed Gonadal Dysgenesis. She has one testis and one ovary and could easily pass as either male or female. But which is she, really? She was raised as a boy, despite the fact that she would rather play dress-up than football. Now that her older brother, Scott, has been killed in Vietnam, Jamie’s parents—and her father, especially—need for her to be a boy. Convinced that her cross-dressing is a phase she’ll outgrow (a phase which has lasted sixteen years, mind you), her father feels that Jamie will come to her senses once she experiences the joys of being a man. He agrees to consider letting her live as a woman only if she completes a list of “Things Boys Do,” a series of tasks that ranges from getting her hair cut short, to hunting and killing an animal, to learning to drink and smoke. Fortunately, Jamie can do most of those things--how hard can it be to get your hair cut?—but can she do these things as a man? I found Jamie to be a refreshing protagonist. Far from being a rebellious youth, she’s actually very respectful of her parents, even though she comes to realize that if she doesn’t embrace her true self, she’ll be torn apart by misery. I also appreciate the fact that even though we never really get to know Jamie’s parents beyond their roles as the story’s antagonists, they are never reduced to mere stereotypes. My only complaint is that the supporting cast is not more fully developed. But it is Jamie’s story, after all. For readers born with conditions similar to Jamie’s, Confessions of a Teenage Hermaphrodite will certainly be a welcome addition to this neglected area of young adult fiction. For those born without such difficulties, it’s still an enlightening, eye-opening experience. Recommended for Ages 16-Up.